Twitter brings joy, laughter, news, and best of all, controversy. Whenever celebrities, politicians, or even brands tweet something that's slightly offensive, there will always be that person who makes it a big deal. However, there are times when a famous person actually does post a dumb tweet, but before it can be deleted, one of their million followers has already taken a screen shot and made it viral. Even in 2017, celebs have still not learned that they don't have to tweet every single thought. Whether they were drunk tweeting or cursing at an Internet troll, these famous people need to either hire a PR person to clean up their mistakes or just delete their Twitter accounts. It's definitely not good publicity for a celebrity when the whole world has seen your racist, ignorant, and disrespectful tweets. Featuring the most offensive and controversial tweets from celebrities and companies, this list has all the biggest Twitter fails of 2017. If you think the quickly-deleted tweet is hilarious, shocking, or even vulgar, vote it up. If this list leaves you wanting more, see what controversial tweets were deleted in 2019. From August 11-13, 2017, white supremecists gathered in Charlottesville, VA, to protest the removal of a statue of Confederate leader Robert E. Lee. Counterprotestors showed up as well, and soon violence erupted. Twenty-year-old James Alex Fields, Jr. rammed his car into a group of counterprotestors, injuring 19 people and killing 32-year-old Heather Heyer. On August 15, President Trump retweeted a cartoon showing a train running over a man bearing the CNN logo. "Nothing can stop the #TrumpTrain!" the tweet read. He quickly deleted the retweet, but it had already been captured and retweeted countless times. The tweet was considered to be in incredibly poor taste, arriving merely days after people were literally ran over in the street. We're Gonna Need A... WHAT Boat?! 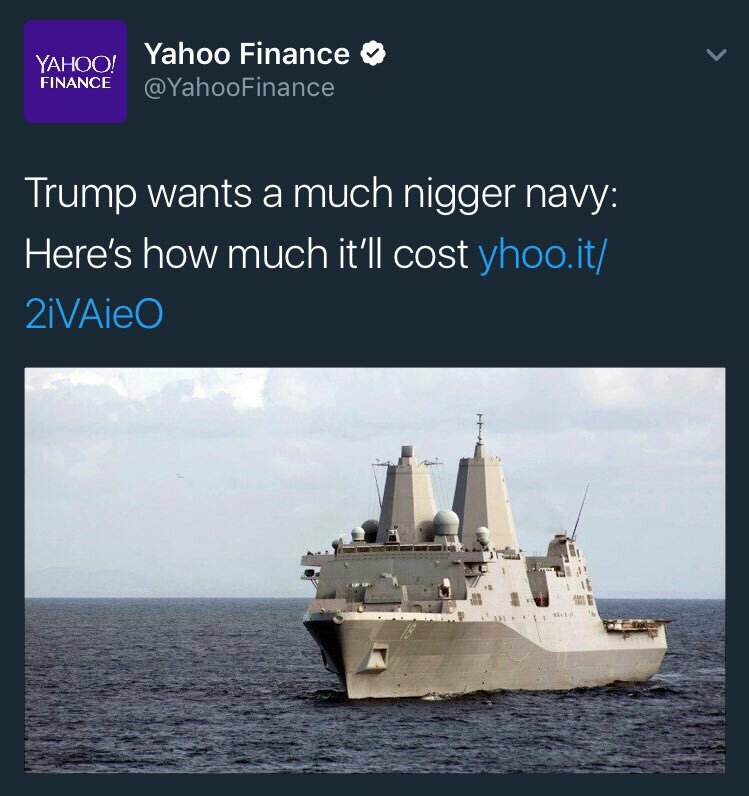 Yahoo Finance might want to consider checking their tweets before sending them. The online news service sent out a tweet about about Trump wanting a "n*gger navy." The attached story outlined Trump's desire to increase the navy's size. Twitter went crazy over the mistake, with many cracking jokes at Yahoo's expense. The company quickly deleted it and issued an apology, but not before the screenshot was passed around all corners of the interwebs. The Express, a free weekly tabloid produced by the Washington Post - excitedly tweeted out its upcoming cover for its January 5, 2017 edition. The lead story: The Women's March on Washington. 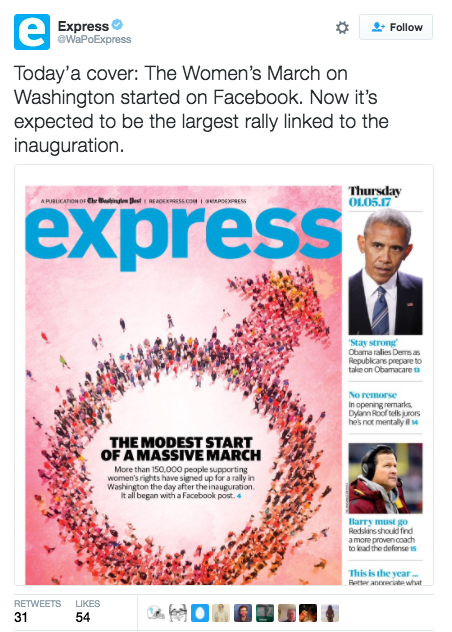 Except the cover art, meant to depict one of the largest marches in modern history organized by women, accidentally used the symbol for male instead of female. Critics were quick to point out the blunder. One woman asked "do you have any women on your edit team," questioning as to how, exactly, such a huge mistake even made it to print. The Express quickly deleted it and issued a new tweet with the proper symbol and an ironically misspelled word. "We made a mistake on our cover this morning and we're embarrassed," they wrote. "We errnoeously [sic] used a male symbol instead of a female symbol." On August 27, Kenneth L. Storey, a visiting sociology professor at the University of Tampa, tweeted suggesting that Hurricane Harvey was "instant karma" for Texas voting Republican. He quickly removed the tweet and deleted his account, but the damage was done. The school received a flurry of criticism for the post, and Storey was promptly fired. Storey issued an apology on the 28th, saying he "never meant to wish ill will upon any group." The university, meanwhile, said it "stands in solidarity with the people impacted by Hurricane Harvey."